Do you feed oyster shells to your chickens? All the experts say we’re supposed to offer them to our hens when they are laying for stronger shells and to avoid having ‘soft shells.’ Because of the calcium in the oyster shells. I’ll be honest. My hens ignored the oyster shells and almost NEVER ate any, so I stopped offering them because it was a waste of money to buy them. But this spring, when I had a rash of soft-shelled eggs, I started looking for a better alternative. Ones my chickens would enjoy and wouldn’t end in me paying for a partially used, but mostly ignored, bag of something from the store. According this nutritional facts site, egg shells are 90% calcium. Purina Oyster Shells are pn;y 36-41% calcium, as per their website. DuMor’s Oyster Shells are 33-38% calcium, according to Tractor Supply. Well, I don’t know about you, folks, but I’m sticking with the egg shells. More calcium, and my hens actually LOVE them. Plus, it’s pretty much a free bi-product of raising chickens. I start by rinsing the egg shells after use, to clean off the membrane and any slime from the raw egg. Then I let them dry on a paper towel or inside an empty egg carton, usually over night. 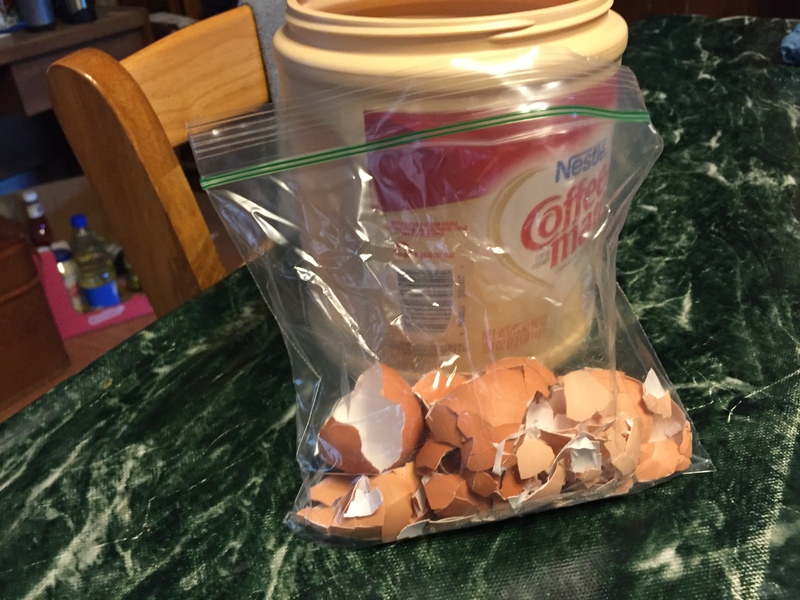 A 35.3 ounce creamer container, like the one shown here, holds about 2 – 2 1/2 dozen egg shells. When the container is full, that’s when the REAL fun begins. I take a plastic sandwich bag and fill the bag with shells. Note that this is NOT all the shells. I crush them a little, and repeat the process until all the shells are in the bag. 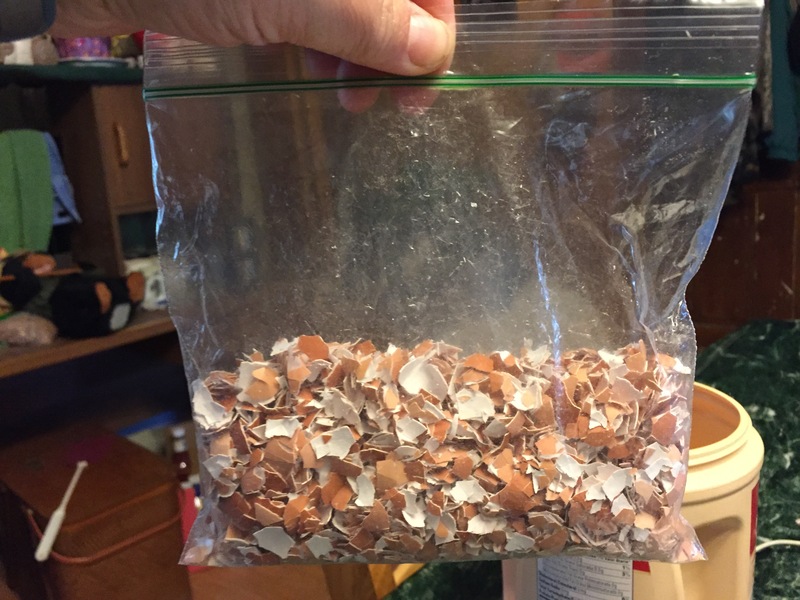 Once your bag is full, you zip it closed – I leave a little open so the bag won’t explode – and crush the shells with your hands until the pieces are small. But not too small. If they are tiny, or crushed into a powdery consistency, the hens will NOT be able to absorb the calcium. This is about how small I crush mine. 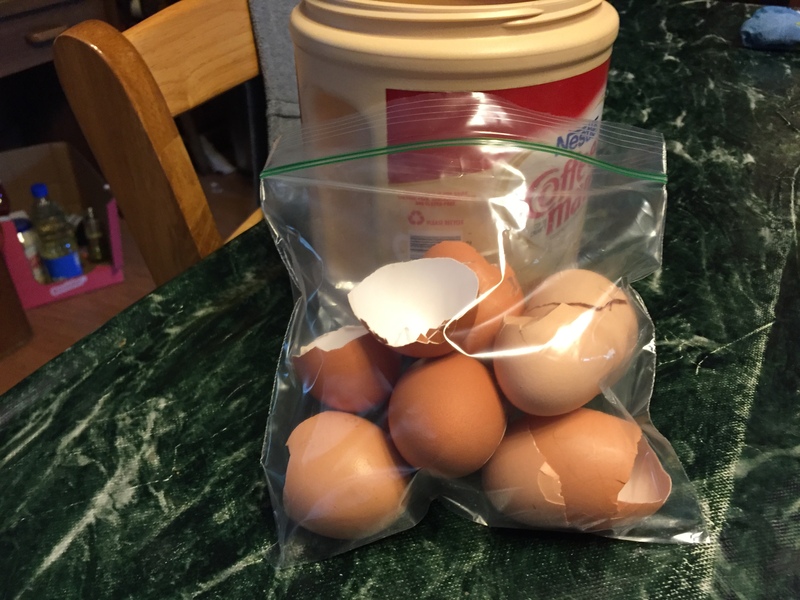 Yes… that huge bag of egg shells equals a half a sandwich bag. It takes me about a week to get that much, most of the time, but it’s so worth it. You’re supposed to offer the egg shells in separate dish next to their feeders, so the hens can eat them at will. But since my girls free range a lot, I take this little bag down to the treat dish in the afternoon, yell “TREAT” and wait till they gather around to dump it in. They eat it,because they think they’re getting a treat, and they’re less wasted because they don’t step in it, spill it on the ground, or poop in it. 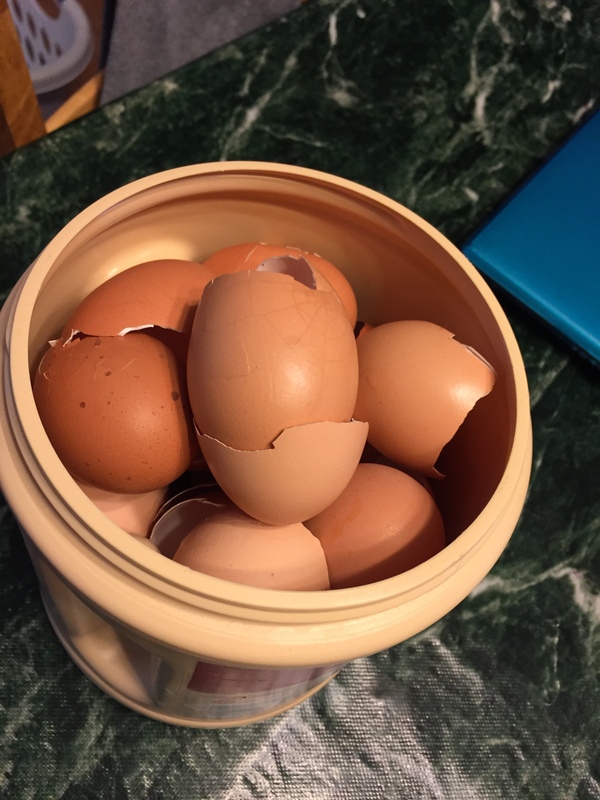 Some commercial layer foods supposedly have calcium in them – so you don’t always HAVE to supplement, but the hens do like the eggshells given back to them. And if for some reason they are lacking in calcium this is good to do – sometimes certain hens will need more. I give my shells back to my hens too – I save them in a bowl (but I think your creamer container idea would work better) and I use a potato masher to crush them up. 🙂 I think my hens ate the oyster shell when I’ve bought it, but it’s cheaper and probably better for them to give them their own clean shells back. Mine turned their noses up at the oyster shells. It was such a waste. I think you can garden with them?